This entry was posted in Culture, Japan and tagged Children, Impressions of daily life, Japanese culture, nap, People watching, Train, Transportation by Haruko-chan. Bookmark the permalink. because of japan, i can comfortably read a book inside a train or take a nap, that is if i manage to find a sit 🙂 love this post! so true and reflects a piece of the daily lives! 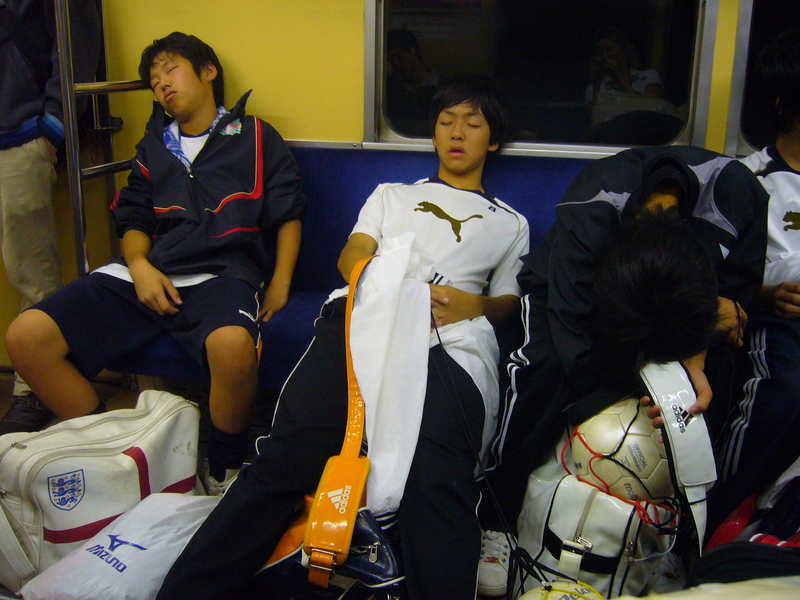 The great thing about Japan is that you can sleep anywhere and not feel unsafe like you would never be robbed on the train. Very true! On a Belgian train I am even afraid to briefly close my eyes. Over here, you never know what people will do when you are not looking. I must have been Japanese in another life. While I don’t use public transportation here at home, I did while in Germany. I can fall asleep sitting upright so easily! It was a tad bit embarrassing because I would end up dropping my cell phone and waking myself up to notice I was being looked at. :p It’s especially difficult when you have a hot guy sitting next to you as you sleep with your mouth hanging open.